This is the last stroke of the race. The finish of the stroke sequence exhibits an extended reach for the wall (frame #18) with the head thrust well down. That head action should assist in raising the legs to a streamline position, something that will facilitate the glide to the wall. This sequence demonstrates the features described in the previous analysis at 75 m of the same race. A most striking aspect is depicted in frames #5 through #10. Of particular note is the positioning of the upper arms. In frame #5 the upper arms begin to medially rotate and the elbows bend. The upper arms "rise" to an "elbow-up" position. Frames #6 through #9 demonstrate a vigorous adduction of the upper arms. The use of the external rotators of the shoulders (infraspinatus, teres minor, and supraspinatus) is greatly facilitated with this position. The "power" of the direct pulling action will come from the combined effects of both the internal (anterior deltoid, pectoralis major, and latissimus dorsi) and external rotator muscles. This is an improvement and departure from the "insweep-outsweep" swimming action that mainly uses the internal rotators to develop weak lift forces for propulsion. The superb streamlining of the swimmer is clearly depicted. The flexibility of the upper back, to facilitate the shoulders and head rise, and the lower back, the pelvic girdle tilt sustains an elevated position of the legs in the early phases of kick preparation, is a valuable attribute. The only troubling feature in Megan Quann's stroke is her downward kick. It probably is partly caused by the straightening of the tilted pelvis and partly by her early recovery, which rises out of the water (frames #13 and #14). The ensuing "dive" of the arms on the forward stretch (see the arms angled downward in frames #15 through #17) probably contributes to slight flexion at the hips. 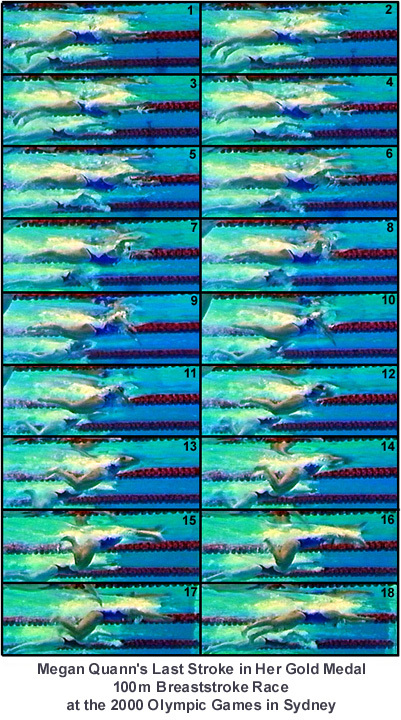 The position of the feet in frames #15 and #16 also illustrate a consistent characteristic of champion breaststrokers, the feet are fully everted, rotated outward, and comfortably wide to position the largest propelling surface possible to produce an effective direct backward kick.